Lions can really roar. 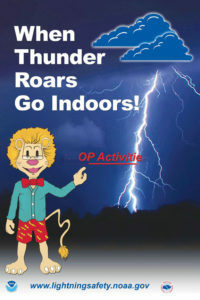 That’s why the National Weather Service made Leon the Lion its mascot to promote lightning safety. Since nowhere outside is safe in or near a thunderstorm, find a safe place. Next Post Mother Earth’s Guardian Angel or Corporate Greed’s Satanic Shield?